Eat your grains! 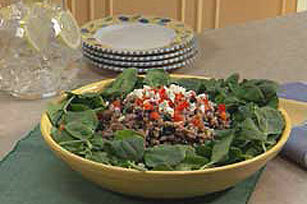 And do it deliciously with recipes like this leafy spinach salad topped with kasha, black beans and feta cheese. Mix egg white and kasha until blended. Heat heavy medium nonstick skillet on medium heat. Add kasha mixture; cook and stir 3 min. or until mixture is cooked dry and kasha grains have separated. Stir in water; bring to boil. Cover; simmer on medium-low heat 10 min. or until water is absorbed and kasha is tender. Spoon kasha into medium bowl. Add beans and onions; mix lightly. Cover platter with spinach; top with kasha mixture, cheese and peppers. Drizzle with dressing. Prepare as directed, omitting the dressing; refrigerate up to 2 days. Drizzle with dressing just before serving. Prepare using your favorite KRAFT Dressing. See our online video, Cooking Kasha. If you prefer cooking your own black beans from dried beans, you will need 2 cups cooked beans for this salad recipe.